In the nineteenth century, organs were exhibits at the World’s Fair (Exposition universelle), not just for their cultural relevance, but for their technology. Mechanical action instruments were growing larger and needed new technologies, such as the Barker lever to keep the instrument playable. While technology has continued to advance for the pipe organ (see how my iPhone can play the organ), organists and organ builders can be a little slow at times to embrace new technology. Spotify officially launched in October of 2008. I might have looked at it sometime in the past nine years, but only recently have truly started diving into the playlists and artists hiding out there. Improvisation recordings have historically been hard to find. Anytime I spot a CD with an improvisation on it, I’ve tended to pick up the recording right then. For a while, I even restricted my CD purchases to recordings with improvisations on them. No improvisation = no purchase. Now, Spotify makes the recordings available for free! No need to wait for a recording to arrive in the mail. You can listen to some fabulous playing as soon as you register with them. There are even some interesting compilation albums like The Britannic Organ, Vol. 11: Historic Improvisations by British & German Organists which includes improvisations by Edwin Henry Lemare, Alfred Hollins, William Wolstenholme, and Kurt Grosse. YouTube has been a great resource. The videos of organ improvisations there are too numerous to catalogue. 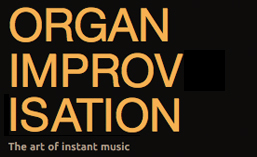 (Even so, I’m trying to keep a master list of all the ones included on organimprovisation.com here.) I’m delighted to see that Spotify is another great resource to help immerse ourselves in the realm of improvisation. As mentioned last week, I made a presentation on improvisation to the local Baltimore AGO chapter. For those who asked, I have video from there that I hope to post soon. I also was able to attend a workshop by Bálint Karosi on Friday evening that he gave for the Lancaster AGO chapter. Any time I discover someone else teaching improvisation, I’m always interested in hearing what they have to say. I was delighted to hear Bálint start drawing parallels between music and language! This week I’ll be attending the AGO Pedagogy conference in Lawrence, Kansas. I look forward to being renewed and inspired this week through all the presentations and interactions. I already know there is a contingent from Baltimore. I hope to see many more of you there! If you can’t be there, listen to some French improvisations on Spotify. Immerse yourself and be inspired! This entry was posted in Information, Newsletter and tagged Newsletter, Spotify. Bookmark the permalink.